I haven’t managed to do a lot because of the snow – much the same as a lot of other people out there – however we are lucky enough to have a small indoor school which we can lunge and loose jump in so despite not being able to ride I have built myself up a great team of equines suitable for vaulting and it has kept the freshness at bay! Just before the snow came I spent the day with 3 horses at the British Evolution Squad Training with Comdt John Ledingham! This is all paid for by Lottery funding and British Showjumping and it was a great day. The plan going forward is to do a couple of smaller shows then go to Bury Farm Elite Show at the beginning of February in preparation for a trip to Portugal shortly after for four weeks. Hopefully the weather will be better there than it is here! This year we have some exciting prospects. 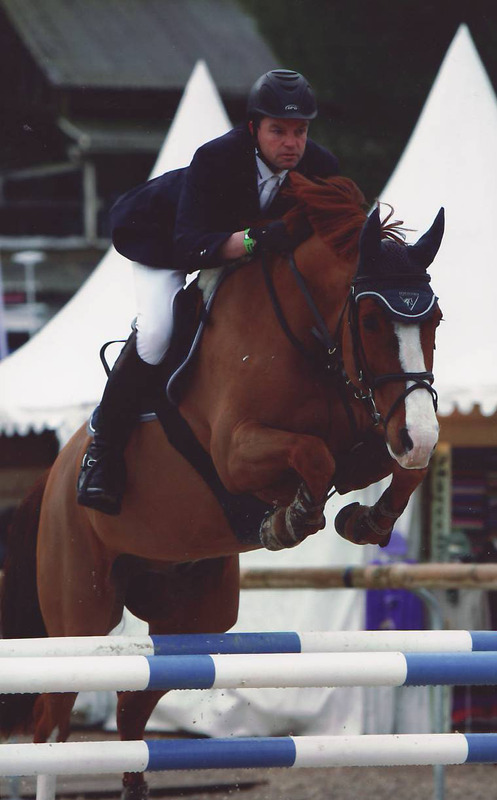 Virginia 188 is an 8 year old mare who will be starting to jump Grand Prix classes and I also have a 10 year old horse from Spain called Pinto de Lusse who will be jumping Grand Prix classes too. We have some fabulous youngsters, Smirnov is a 7 year old and I have high hopes for him in the Foxhunter and Age Classes, then I have two 5 year olds who have a lot of potential; Darya-I-Nur who won the 4 year old Hickstead Championships last year and Don Camillo S a stallion who will be aiming for the young horse classes. Good luck over the next month Philip, we look forward to hearing how you get on! 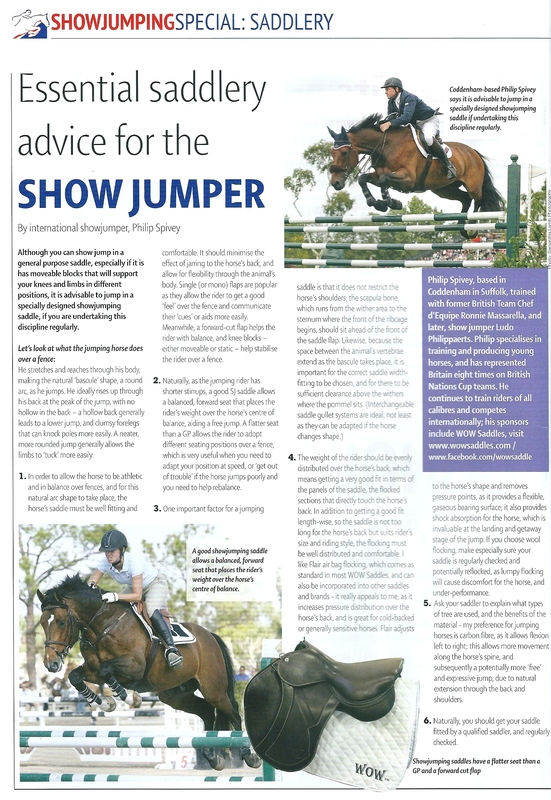 We are extremely pleased to be sponsoring International show jumper Philip Spivey. SMS-qualified saddle fitter and Co-Founder of First Thought Equine, David Kempsell, says he is excited to be working with Philip. “Philip is a renowned trainer and producer, so progressive improvement and correct development of the horse is paramount to him – that’s what builds equine strength and ability. Philip understands the technology behind WOW Saddles, and their potential for enhancing equine comfort and performance,” David states. 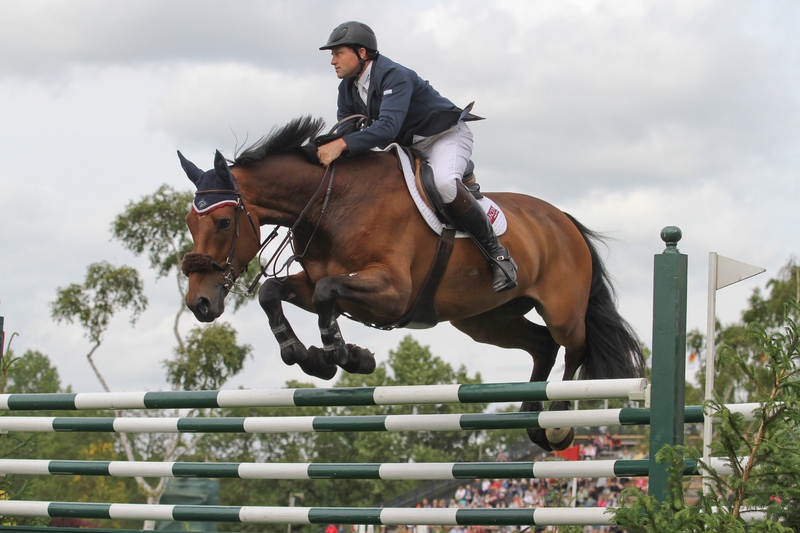 Philip Spivey trained with former British Team Chef d’Equipe Ronnie Massarella, and later, show jumper Ludo Philippaerts. Philip is based in Suffolk, where he trains and produces young horses; he has represented Britain eight times on British Nations Cup teams. Philip continues to train riders of all calibres and competes internationally; he says he is thrilled to be working with WOW Saddles. “Obviously, comfort and performance are key for show jumping horses, which is why I was interested in the concept of WOW saddles. The carbon fibre tree is excellent for allowing equine stretch and extension through the back and shoulders, and the Flair air bag flocking really appeals to me, as it increases pressure distribution over the horse’s back. It is also great for cold-backed or generally sensitive horses,” Philip states. Philip is working with WOW on an exciting, secret prototype jumping saddle, to create the perfect saddle offering rider stability and comfort, along with enhanced equine performance. The saddle launches shortly. Philip joins a ‘stable’ of successful equestrian competitors sponsored by First Thought Equine, including eventers Francis Whittington, Kitty King and Paul Tapner, and dressage riders Richard Davison and Wayne Channon.